Prussia in its modern meaning came into existence only in 1701, when the elector of Brandenburg assumed the title “King in Prussia.” Before then Prussia meant only the flat, sandy region later known as East Prussia (excluding the bishopric of Ermeland), separated from Brandenburg by a part of Poland (later known as West Prussia) and bordering on the Baltic Sea. The original inhabitants, the Borussi (or Prussians), were of Baltic stock. They were conquered and largely exterminated by the Teutonic Knights in the 13th century. The Knights effected the Germanization of Prussia. Stendal lies in the Altmark which in the present day comprises the northern third of Saxony-Anhalt. The territory of the former margraviate and federal state, known colloquially (but not accurately) , as the Mark Brandenburg, lies in present-day eastern Germany and western Poland. Geographically it encompassed the majority of the present-day German states Brandenburg and Berlin, the Altmark (the northern third of Saxony-Anhalt), and the Neumark (now divided between Poland's Lubusz and West Pomeranian Voivodeships). Parts of the present-day federal state Brandenburg, such as Lower Lusatia and territory which had been Saxon until 1815, were not parts of the Mark. Firstly the fact that almost continuous war and strife, not only in Germany but across the European states led to large-scale poverty and hunger amongst the poor. During the War of Spanish Succession (1701-1713), Prussia suffered economically. Most devastating was the famine which struck the Duchy in Prussia 1709-1712 under King Friedrich I. (1688-1713, When Friedrich III. died in 1713, he left behind state debt. His successor, Friedrich Wilhelm, was thrifty to such an extent that he was called avaricious, and a Barbarian (for discontinuing to provide for lavish artistic entertainment at court). 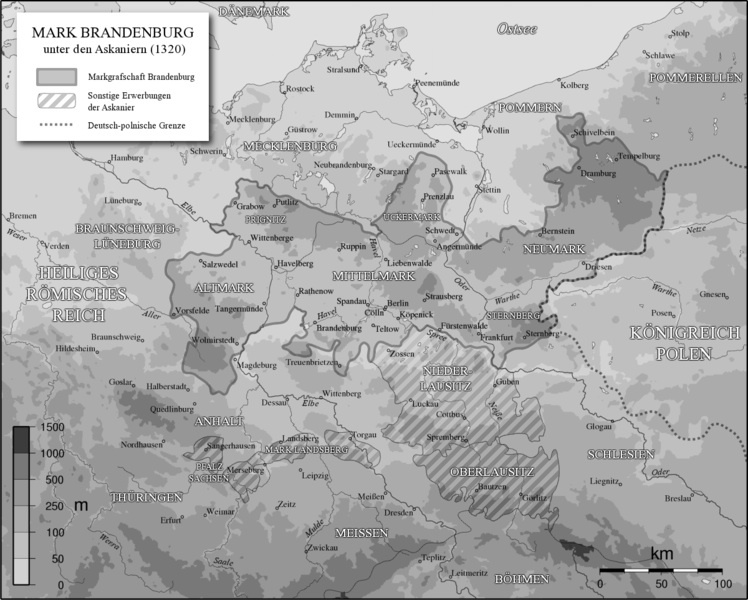 These conditions in the 17th and early 18th century Brandenburg was compounded by the fact that you could be impressed as soldier by any of the armies passing through the region. In 1740, Prussia's army was the fourth strongest, by numbers, in Europe (83,000 men). When King Friedrich (Frederick) I. died in 1713; he was succeeded by Friedrich Wilhelm I. (1713-1740), nicknamed Soldatenkönig (soldier king). Like his grandfather, he focussed state policy, state spending, on the army. He was particularly fond of the Lange Kerls, a regiment of exceptionally tall soldiers. In order to recruit soldiers, trickery, deceit, pressure and violence were used, occasionally even abduction. Rigorous discipline was enforced, deserters treated barbarically. Friedrich Wilhelm treated his own son, the future Friedrich (Frederick) the Great, with a similar harshness; when young Friedrich, with a close friend, attempted to flee the country, the soldier king had the friend executed and had young Friedrich look on. During this period farmers that owned little or no land continued to search for work, often temporarily migrating to work elsewhere during the harvest season. Some were permanently attracted by the rural industries which flourished especially after 1750, whilst others came to live in large cities that, being centres of trade and administration, needed many employees. Secondly; some 550Km away in Amsterdam the VOC started to experience problems with recruitment. The VOC was, without doubt, the largest private employer of the world in the seventeenth and eighteenth century. The often cited data on the numbers of sailors, soldiers and others that sailed in the service of the VOC to Asia demonstrate the impressive size of its workforce. Between 1602 and 1795, nearly one million men went overseas of which only one third returned. The local and national labour market was far too small to provide sufficient workers for the Company. Sometimes the shipbuilding industry of the VOC competed with the shipping industry. For instance, in total the VOC fitted out some 4700 ships, nearly 1700 in the seventeenth century and a good 3000 in the eighteenth. When there were many ships to be built, there was much employment and this created a lack of sailors. Many came from Germany, but there were also many VOC-servants from Scandinavia, the Southern Netherlands, France and England. In the beginning of the 18th century only the officers on most VOC-ships were still Hollanders. As the initial territory of the Brandenburg margraves, the Altmark is sometimes referred to as the "Cradle of Prussia". The Altmark is located west of the Elbe river between the cities of Hamburg and Magdeburg, mostly included in the present-day districts of Altmarkkreis Salzwedel and Stendal. In the west the Drawehn hill range and the Drömling depression separate it from the Lüneburg Heath in Lower Saxony; the Altmark also borders the Wendland region in the north and the Magdeburg Börde in the south. Adjacent east of the Elbe is the historical Prignitz region. The population is small. The cultural landscape within the North European Plain is rural and widely covered with forests and heathlands. The largest towns are Stendal, with a present-day population of 39,000, and Salzwedel. The most famous native is Chancellor Otto Von Bismarck, born at Schonhausen, in the Altmark, April 1, 1815. The Altmark remained with the Brandenburg margraviate, since 1415 held by the House of Hohenzollern, and thereby became part of rising Brandenburg-Prussia and of the Kingdom of Prussia upon its creation in 1701. The two traditional naming conventions are the Cape Dutch and the German traditions respectively. Additionally, if a child should die, the next child’s name will revert to the convention. The German tradition did not have a set convention, but generally children were named after the witnesses to the baptism/christening. The function of the witnesses were not so much as to witness the event, but rather to ensure that the parents complied with their vows and to accept the responsibilities for care of the child if the parents should meet with misfortune. Baptisms in the early days did not necessarily take place on a Sunday and in church. Because of the difficulties in getting to towns by ox wagon or horse and cart, and the spread-out distribution of the nomadic farmers, the ministers did the travelling. So that if a minister was visiting a certain area, the word would be spread to the Trekkers. Thus they would meet on a given day of the week on a farm in the barn or house. At such times all the un-baptised children would be baptised and the minister would travel onwards to the next area. From Leonard Guelke, "The Early European Settlement of South Africa, " (PhD diss., University of Toronto, 1974), 409. This section only provides a very high level overview of the situation. By 1740, in the Cape of Good Hope, the phenomenon of the Trekboer had begun as more and more farmers became stock farmers due to overproduction of argricultural products which had to be sold the the VOC (at set VOC tariffs). Families were large, forcing young men to find grazing land for their stock. These men would pack their belongings in a wagon and become nomadic farmers moving northwards, both to find better grazing for their livestock and to escape the autocratic rule of the VOC who still governed the Cape. The trek farmers followed a routine whereby they would graze the land rented from the VOC until, due to the relatively small sizes, the land became exhausted and they would merely pack up and trek to the next available grazing land. Intense resistance from the San people (the so-called Bushman) were experienced in which the pioneer farmers would suffer stock theft and continued sporadic attacks by the San over a period of more than 20 years. This resulted in several punitive expeditions against the San. At the same time, though, it was not uncommon for the farmers to employ Khoikhoi (also referred to colloquially as the Hottentot) people to help them in herding the cattle, to the point of arming them. 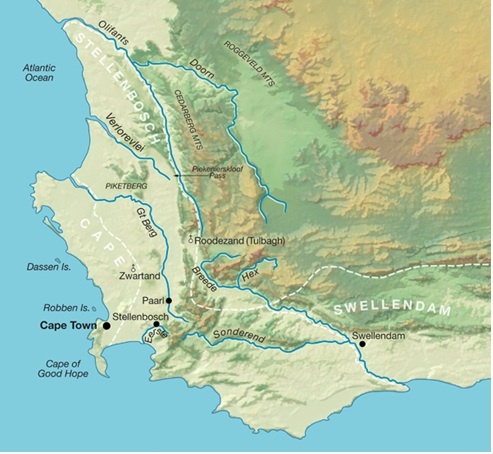 By 1778 the border of the Swellendam district had reached the Great Fish River, which then became the Eastern border. The VOC, concerned that they were losing control over the population, were forced to follow in their tracks and establish new districts such as Swellendam and Graaff Reinet. The frontier farmers, however, kept on moving across the borders. This eventually put them in a position of direct conflict with the Xhosas who were not prepared to part easily with their own heritage. The districts were very large which sometimes leaves the researcher in a quandary. A child may have been born in Graaff-Reinet but until it became an established district, the birth would be recorded as being in Stellenbosch. 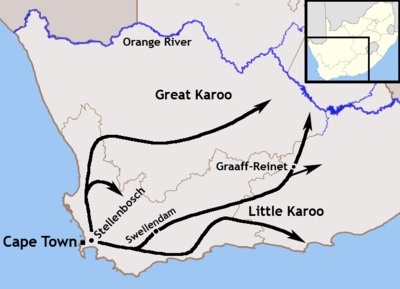 Thus it was that by the time the Great Trek, one of the greatest mass-migrations in history started in 1835, most of the trekkers were already in the present-day districts of Graaff-Reinet, Middelburg, Cradock, Aliwal North and Burgersdorp. Indeed some farmers had already crossed the Great River (also known as the Orange and Gariep).